When he/she wears this Kids Plush Wolf Costume he/she can decide whether to be fierce or friendly. This wolf costume is a cute addition to bring the classic fairy tail story of little red riding hood to life! 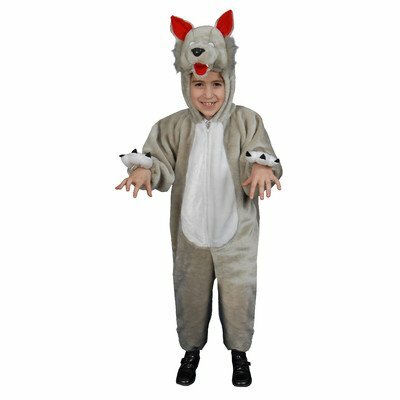 Kids Plush Wolf Costume Comes Complete With: Plush Jumpsuit with attached Head. Available Size in: Toddler 2, Toddler 4, Small (4-6), Medium (8-10) and Large (12-14).
? Very durable: resistant to most chemicals, stretching and shrinking, wrinkle resistant, mildew and abrasion resistant.
? Polyester is hydrophobic in nature and quick drying.
? It is easily washed and dried.